We get it, keeping up with the latest health news is hard. You’re busy already—it’s enough to fit into your packed schedule your daily workouts and food prep without also adding in time to wade through health research that’s actually applicable to you. Rest easy, friend, because Dallas Iron Fitness has done the work for you. 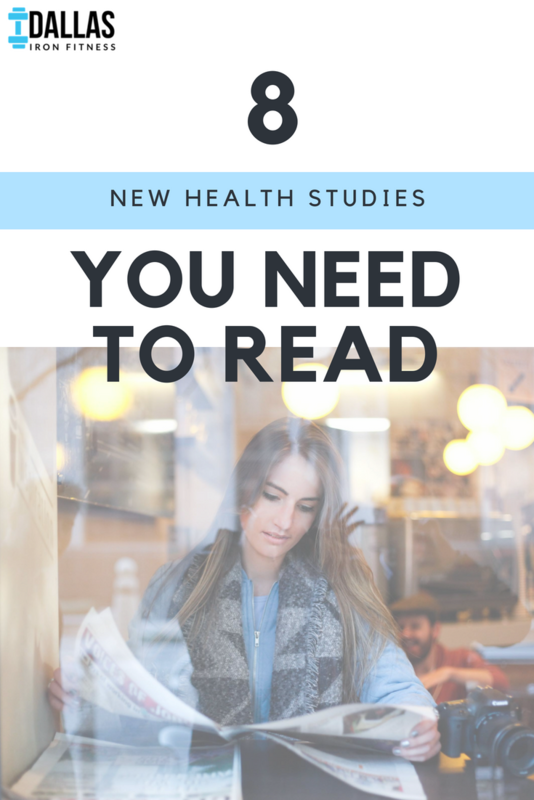 We’ve read through the articles to bring you 8 new health studies that you’ll definitely want to read up on. (Hint: you need to put down the wine bottle, but you can keep your coffee and chocolate.) No #fakenews here. Here’s 8 new health studies you’ll definitely want to read. “A new study called the ‘Habitual Diet and Avocado Trial’ wants to pay people to eat an avocado every day for six months,” according to this Huffington Post article. Um, where do we sign up? Researches from universities across the U.S. are teaming up to determine if regular consumption of avocados can help people lose belly fat. They’re looking for 1,000 research subjects from Loma Linda University, Pennsylvania State University, Tufts University and the University of California, Los Angeles. These people will then be split into two different groups: one group will get to eat an avocado daily for six months; the other group will be relegated to eating only two total avocados for each month. This data will then be sent to Wake Forest University, which will then share the results with us. We’ll be waiting (and rooting for the avocado, obvs). An intriguing new study from the Salk Institute in California found that mice with unhealthy metabolisms saw benefits when they were only allowed to eat within a 10-hour window. According to the senior author of the released findings, "For many of us, the day begins with a cup of coffee first thing in the morning and ends with a bedtime snack 14 or 15 hours later. But restricting food intake to 10 hours a day, and fasting the rest, can lead to better health, regardless of our biological clock." We’ve already probably heard the praises sung on high of the Mediterranean diet: fish, veggies, nuts, fruits, olive oil, wine and dairy, inspired by the European residents along the Mediterranean coast. Of course, we don’t have to wait until we’re older to begin taking our diet seriously. We’re sure many of you have seen this new study circulating around the various news outlets. NO alcohol amount?! But what about that “glass of red wine per day” rule we’ve become so familiar with?! Welp, you can't argue with science. So maybe the “glass of red wine per day” tip is out, but at least we can rest easy knowing there’s science to back up our love for dark chocolate. Helloooooo Lindt Dark Chocolate, we’re coming for you. According to a new study of 400,000 adults in China, “Eating an egg a day may lower your risk of cardiovascular disease." Another sigh of relief from us: we can keep our daily cup of coffee (God bless). Now excuse us while we make ourselves another cup of coffee. Meditation isn’t just some woo-woo self-care tip from tie-dye yogis: there really is science to back up the health benefits of a meditative practice. Says the lead author of the study: "Our results show a clear reduction in anxiety in the first hour after the meditation session, and our preliminary results suggest that anxiety was significantly lower one week after the meditation session." Suffering from anxiety? Maybe it’s time for you to give meditation a try!